There were two important reports on the U.S. economy released this morning. First, 31,517 corporate layoffs were announced in America this month, according to new data from Challenger, Gray & Christmas. That is a 12.6 percent decline from April, 4.8 percent below this same period last year, and the lowest monthly total since October 2017. Although encouraging, one should not read too heavily into a single month’s datapoint, especially since John Challenger, chief executive officer of Challenger, Gray & Christmas, added that “On average, job cuts are at their lowest in May and June. 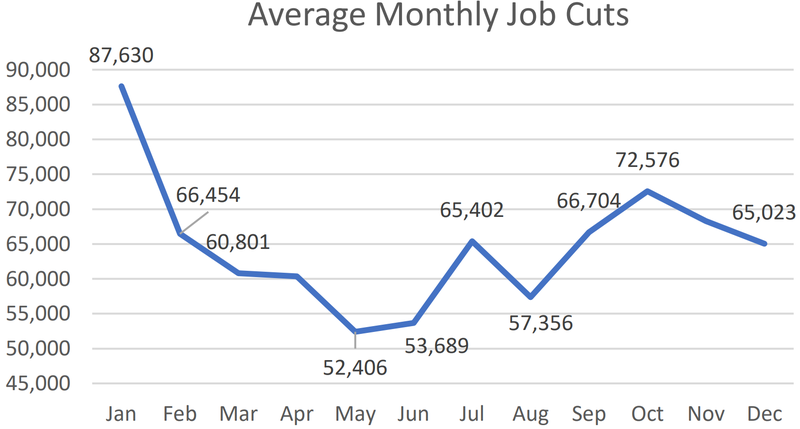 Companies typically make their staffing moves at the beginning of the year or in the fourth quarter.” Zooming out, 207,977 job cuts have been announced 2018-to-date, 6.2 percent higher compared to the first five months of 2017. The retail sector has been a major factor behind this year’s somewhat elevated number of layoffs, as store closures continue to rise due to increased competition from online merchants (Amazon). Elsewhere, a report from the U.S. Department of Commerce showed that personal income for Americans rose by 0.3 percent in April. That is in line with expectations and the 10th monthly gain in a row. 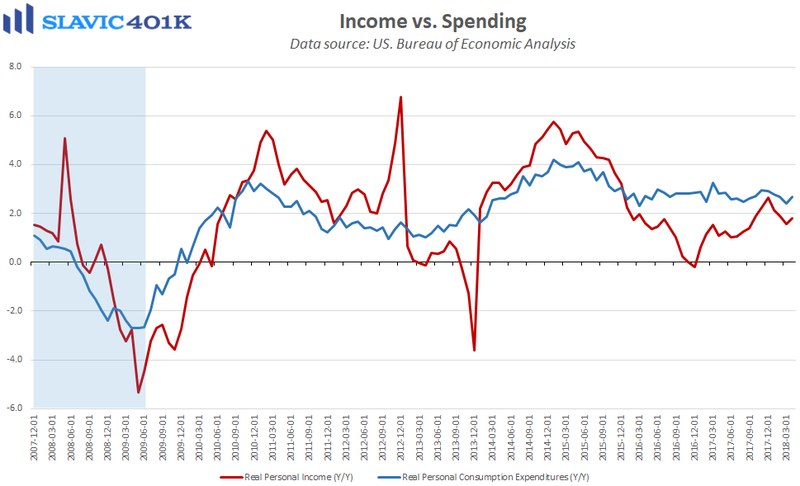 During this same period consumer spending, which accounts for more than two-thirds of the economy (GDP), lifted by 0.6 percent. That is the largest increase since November and provides more evidence that the pullback in consumption following the strong holiday shopping season was only temporary. Rising gasoline prices, though, remain a looming headwind, and Americans’ personal saving rate fell to 2.8 percent last month, the lowest reading of 2018. 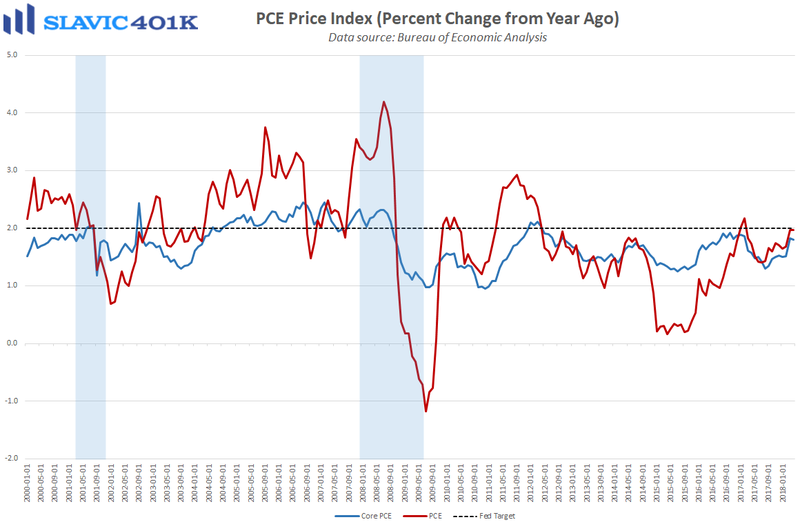 As for inflation, the Federal reserve’s preferred measure of household price pressures rose 0.2 percent in April and is up 1.8 percent over the past twelve months. The latter is down slightly from the March reading and below officials’ 2.0 percent “target,” but likely still not weak enough by itself to derail the Fed’s plans to continue raising interest rates in 2018.